Surla, D., Racković M., The Application of Psi-transform for Determining a Near-optimal Path in the Presence of Polyhedral Obstacles, Computing 48 (1992), 203-212. Racković, M., Surla, D., The Algorithms and Data Structures for Forming Symbolic Models of the Robotic Systems, FILOMAT (Nis) 9:3 (1995), 887-897, Algebra, Logic and Discrete Mathematics, Nis, April 14-16, 1995. Racković, M., Constructing of a Translator for Robot-Programming Languages, Journal of Intelligent and Robotic Systems 15: 209-232, 1996. Racković, M., Vukobratović, M., Surla, D., Generation of Dynamic of Complex Robotic Mechanisms in Symbolic Form, Robotica (1998) volume 16, pp. 23-36. Divljak, N., Racković, M., Planning of the Trajectory for the Tip of the Redundant Robotic Mechanisms in the Presence of Obstacles, Novi Sad J. Math. Vol. 28. No. 2, 1998, pp. 163-171. Racković, M., Dividing the Polynomial Expressions Based on the Criteria of Reducing the Number of Calculating Operations, Novi Sad J. Math. Vol. 28. No. 3, 1998, pp. 137-143. 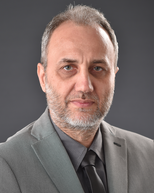 Racković, M., Vukobratović, M., Surla, D., On Reducing Numerical Complexity of Complex Robots Dynamics, Journal of Intelligent and Robotic Systems 24: 269-293, 1999. Racković, M., Surla, D., Generation of the Mathematical Models of Robotic Mechanism in Symbolic Form, Group of Information Technologies, Novi Sad, (In Serbian), 1999. Solarov, R., Racković, M., Surla, D., Object-Oriented Specification of the Information System for Calculation of the Foundation Girder, Novi Sad J. Math. Vol. 30. No. 3, 2000, pp. 141-148. Surla, D., Racković, M., Object-Oriented Specification of the System for Generating Symbolic Models of Robotic Mechanisms, Novi Sad J. Math. Vol. 30. No. 3, 2000, pp. 149-160. Racković, M., Identities in Polynomial Expressions of Mathematical Models of the Robotic Mechanisms, Novi Sad J. Math. Vol. 31. No. 1, 2001, pp. 167-173. Vidaković, J., Racković, M., Generating Content and Display of Library Catalogue Cards Using XML Technology, Software: Practice and Experience, Volume 36 Issue 5, 2006, pp. 513-524. Škrbić, S., Bodroški, Ž., Pupovac, B., Racković, M., Faculty Information System Based on Open Source Technologies, Novi Sad, J. Math, Vol. 37, No. 2, 2007, pp. 59-72. Ivanović, D., Surla, D., Racković, M., A CERIF Data Model Extension for Evaluation and Quantitive Expression of Scientific Research Results, Scientometrics (2011) 86: 155-172. Škrbić, S., Racković, M., Takači, A., Towards the Methodology for Development of Fuzzy Relational Database Applications, ComSIS Vol. 8, No. 1, January 2011, pp. 27-40. Ivanković, Z., Racković, M., Markoski, B., Radosav, D., Ivković, M., Appliance of Neural Networks in Basketball Scouting, Acta Polytechnica Hungarica, Vol. 7, No. 4, 2010, pp. 167-180. Tekić, P., Rađenović, J., Racković, M., Implementation of the Lattice Boltzmann Method on Heterogeneous Hardware and Platforms using OpenCL, Advances in Electrical and Computer Engineering, Vol. 12, No. 1, 2012, pp. 51-56. Ivanović, D., Surla, D., Racković, M., Journal Evaluation based on Bibliometric Indicators and the CERIF Data Model, ComSIS Vol. 9, No. 2, June 2012, pp. 791-811. Škrbić, S., Racković, M., Takači, A., Prioritized Fuzzy Logic Based Information Processing in Relational Databases, Knowledge-Based Systems, (ISSN: 0950-7051), Vol. 38, pp. 62-73, 2013. Škrbić, S., Racković, M., Fuzzy Databases, Faculty of Natural Sciences and Mathematics, University of Novi Sad, (ISBN: 978-86-7031-270-8), Novi Sad, 2013. Panić, G., Racković, M., Škrbić, S., Fuzzy XML and prioritized fuzzy XQuery with implementation, Journal of Intelligent and Fuzzy Systems, (ISSN: 1064-1246), Vol. 26, No. 1, pp. 303-316, 2014. Ivanković, Z., Racković, M., Ivković, M., Automatic player position detection in basketball games, Multimedia Tools and Applications, (ISSN: 1380-7501), Vol. 72, No. 3, pp. 2741-2767, 2014. Kresoja, S., Racković, M., Škrbić, S., Dimić Surla, B., A Petri Net Extension for Formal Modelling of Information Systems, Computer Systems Science and Engineering (ISSN: 0267-6192), Vol. 31, No. 3, pp. 223-237, 2016. Pecev, P., Racković, M., Ivković, M., A System for Deductive Prediction and Analysis of Movement of Basketball Referees, Multimedia Tools and Applications, (ISSN: 1380-7501), Vol 75, Iss. 23, pp. 16389-16416, (DOI 10.1007/s11042-015-2938-1), 2016. Dependent Time Series Prediction, Computer Science and Information Systems (ComSIS), Vol. 14, No. 2, pp. 467-490 (DOI: 10.2298/CSIS150815004P), 2017. Tekić, J., Tekić, P., Racković, M., Lattice Boltzmann Method Implementation on Multiple Devices Using OpenCl, Advances in Electrical and Computer Engineering, (ISSN: 1582-7445), Vol. 18, No 3, 2018, pp. 3-8 (DOI: 10.4316/AECE.2018.03001).